So I got one of the Dark Alliance orc catapult sets. But I am not entirely sure how to assemble it. Helpfully there are no pictures or instructions on the box or online. Does this look right? Not glued yet! That wooden crank needs to have enough room to turn. I can't tell from this angle if it does. Otherwise, it looks pretty good. Looks nice, but I think Moderator Paul is the expert on orcs and their machines. Only seen Prince August's orc-catapult before and just on pics. It´s correct for the troll who is leaning Forward with both Hands on the ground. It won´t work for the troll Standing up..the catapult arm Needs turning around (drill a hole through so the sling fits) other wise the Stone in the sling hangs on the ground. Believe me..I´ve just finished putting both of them together. Also..no matter what glue you use the trolls won´t stay put on the bases and the catapults fall off the trolls..it all Needs screwing, welding and nailing together. IMHO, they are ok when painted etc but there´s no way the catapults would work as they are and to correct them to look halfway functional would mean a lot of work. You can see the two wheels on the sides are in fact rollers for chains but I´ve added spokes to make them look a bit more..? ?..as if they actually do something. The Crews also make Little sense but I´ll work out how they fit with the rest later. I´ll probably have them finished by tomorrow so I can get pics made and Show the Solutions to the None glueable bits. PS:..the fire demons! There it definately Needs a drill and screws to fit the wings properly and watch out for the war trolls set two..if you can, look in the box before buying them!!! Paul wrote: It´s correct for the troll who is leaning Forward with both Hands on the ground. It won´t work for the troll Standing up..the catapult arm Needs turning around (drill a hole through so the sling fits) other wise the Stone in the sling hangs on the ground. Believe me..I´ve just finished putting both of them together. 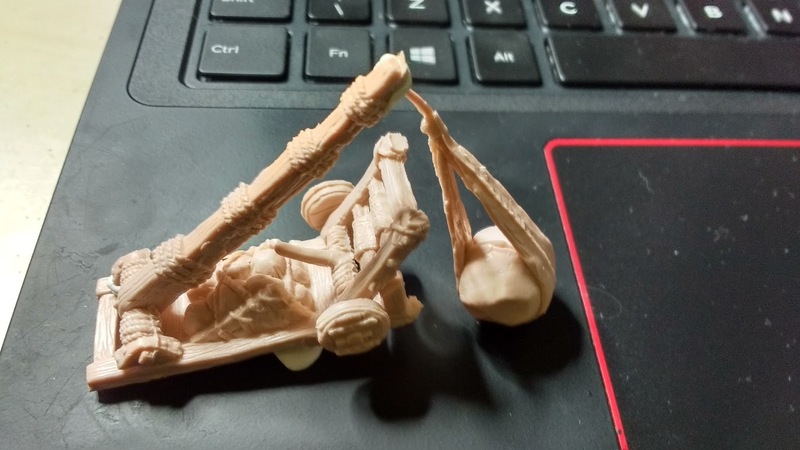 Edit...I´ve found a way to have both the catapults with the arms facing backwards.. Thanks everyone! Gosh, I had no idea trolls were involved. I only have set 3 of the trolls, so not the right ones I don't think. I might make a regular catapult for the orcs to work with and keep the spare one for when I get some of the appropriate trolls (and have seen your instructions Paul!). I did get the two Balrog sets as well. Thanks for the tip - sounds like I will have to get the tools out! 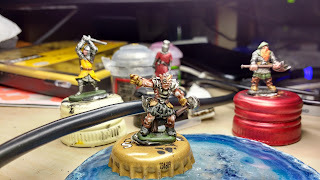 I have had a chance to start on one of the orcs who is painting up well. Mabbers wrote: Gosh, I had no idea trolls were involved. TBH, I don´t think your the only one who didn´t realise this. A few People have made the assumption, including me, that the catapult set were stand alone bits of kit. It´s not been made 100% obvious with the titels of the boxes that the catapults are for attaching to trolls. So this Company has a product for sale, but has a total lack of Why? Where? and How?????? ?___ in Communication Skills. Eh? That is a really interesting solution.